Carbon appears to us in three different forms: diamonds, graphite and charcoal. The sparkly things that have romantic connotations are probably considered the most valuable, but is it possible that charcoal could reclaim this description? Chemically these forms are identical but this is difficult to grasp when they are so different in appearance and physical properties. Let's look at the least exciting of these in more detail. Human beings would not have moved from the Stone Age to the Iron Age without the discovery of the high temperature burning properties of charcoal that made iron smelting possible. This characteristic of charcoal was then exploited from the start of the Industrial Revolution to the early 20th century. Although the discovery of coke's similar properties by Abraham Darby in 1709 led to a huge increase in iron production using the new heat source, charcoal was still used up until 1926 in one foundry at Backbarrow in the Lake District and still is in a number of other countries. An early advance into civilisation found another more fundamental use for the black material. 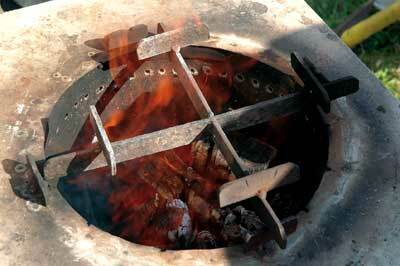 Wood fires provided the simplest source of heat for cooking, but using charcoal was much cleaner and hotter. This of course necessitated human organisation in order for some to specialise in the making of the cooking fuel. These specialists were the 'wood colliers'. The second part of this name was subsequently adopted by coal miners and is still a regular English family name. A public house sign in Bewdley, near the Wyre Forest, carries the 'Woodcolliers' name and a picture of the collier tending his 'charcoal burn' from which the more normal 'charcoal burner' title is derived. 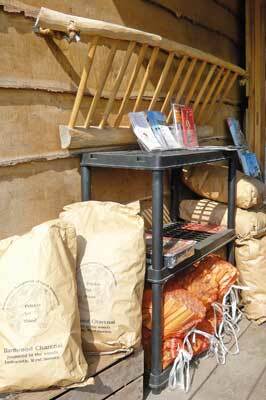 So charcoal making and using was, and still is in some developing countries, a major industry. 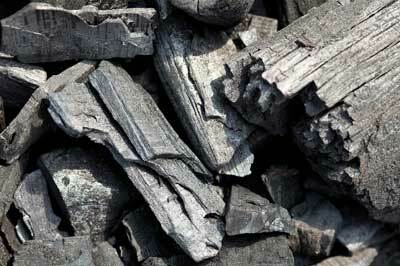 Charcoal is produced by 'destructive distillation' usually of wood, although all organic materials yield charcoal. This is brought about by slowly heating the wood up to a temperature just below that at which the charcoal itself burns and then allowing it to cool. This 'distils' off the other constituents in the wood, many of which burn to provide the heat to maintain the process until the end result of charcoal. Traditionally this was accomplished by slowly burning a large stack of wood under a covering of earth until the smoke almost disappeared; then the resulting charcoal is cooled and extracted. Evidence of this process can still be found in many of the old woodlands in England in the form of round flat areas, 3-5m in diameter, often dug into hillsides at the rear and 'revetted' (built up) at the front to provide a level working platform. 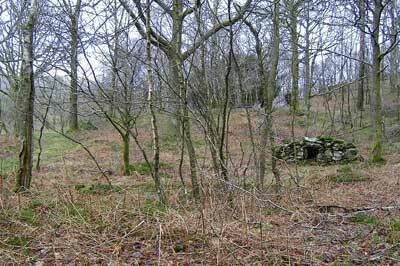 These 'pitsteads' can be found 50-100m apart, usually on slopes where the trees to be charcoaled would have been felled in a quadrant area above the pitstead. This minimised the effort of moving the felled raw material. The subsequent charcoal product weighed only 20% of the original weight of wood and was therefore more easily transported to its final destination. Associated with these pitsteads can sometimes be found the stone foundation circles of the huts in which the charcoal burners lived while tending their burns, which would each take several days and required continuous attention. A rarer find is a hut circle fireplace that still has its lintel. One of these pitsteads and hut circles in the Rusland Valley in the Lake District was made famous when the children visited it in the 1970s film of Arthur Ransome's story, Swallows and Amazons. Much of the wood for charcoal making was grown as coppice, where a tree is cut to a stump which is then allowed to grow further multistems that can be harvested again and again on a regular cycle (5-25 years). This is a sustainable and environmentally beneficial practice providing a biodiverse habitat for a variety of butterfly and bird species, as well as the raw materials for a number of other woodland products in addition to charcoal. 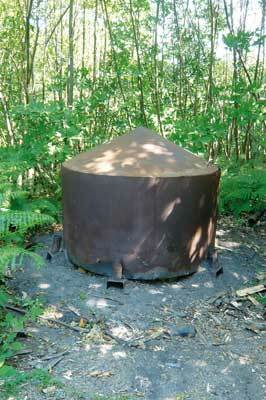 Charcoal made by the industrious colliers was not used only for iron smelting and cooking. Its high temperature burning property was discovered many centuries ago by the Chinese, perhaps in the Ming Dynasty, and used in fireworks. 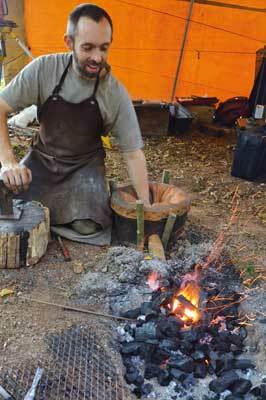 This was possibly the first use of gunpowder in which charcoal is an essential ingredient. Again, extensive archaeological remains of gunpowder factories, especially in South Cumbria, derive from an industry of major importance to British dominance for many centuries. Other significant uses of the material survive to the present day. The absorption properties of activated charcoal, resulting from its porous structure, are used extensively for air and water purification. Household uses are in cooker hoods and garden pond water filters. Gas masks using charcoal saved many lives in World War II. We recently paid a substantial price for a stomach treatment for one of our dogs who was being sick. Yes - medicinal activated charcoal. Have you noticed the black colour of some of the Shapes dog biscuits? Charcoal biscuits are also available for human consumption. It also has steel hardening, hand warming and horticultural uses. 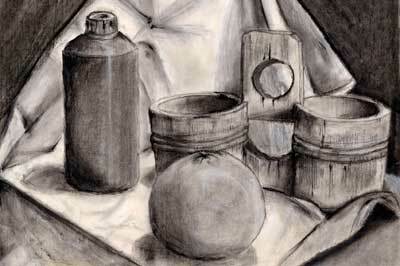 And let's not forget of course the wonderful, versatile artist's drawing charcoal. What about where we almost started - cooking? 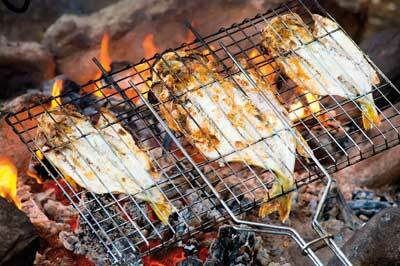 Indians use it in their tandoori ovens, the Western equivalent being of course the barbecue. I am aware that sadly the charcoal is being pushed aside by bottled gas; I say sadly because I feel that the essence of the enjoyment of a barbecue is the fire, but mainly because of another fundamental feature of charcoal. 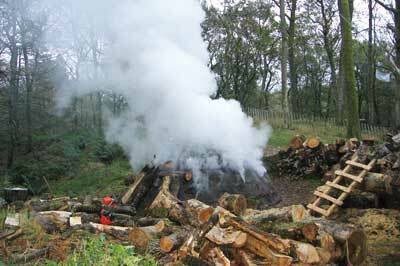 While the trees from which charcoal is made were growing, they absorbed carbon dioxide from the air. Although this is released again when the charcoal is burned, the replacement tree crop that is growing - as coppice - is reabsorbing that carbon dioxide. This overall process, like burning log fires and biomass, is referred to as 'carbon neutral', unlike burning bottled gas derived from fossil fuel sources. A small resurgence of charcoal making in this country has occurred in the latter years of the 20th-century to supply the demand of the barbecuers. The largest portion of this market is met by imports, but a small band of dedicated workers continue the tradition of charcoal making in British and other woodlands. Most of this is now produced in easily transportable round metal kilns that take the place of the earth covering to exclude the majority of the air from the burn. Smaller quantities are made in 'retorts' or even old oil drums. While much of this supply is low key, one project that gained international environmental attention was the UK Case Study presented by WWF International at the Rio de Janeiro Earth Summit meeting in 1997. The case studies generally reflected the implementation of Local Agenda 21. This UK project, initiated and managed by the Bioregional Charcoal Company based in Croydon, supplies all B&Q stores across the UK locally and directly from small individual charcoal makers. At the time it was hailed as the only contract in the world with these credentials. Apart from its excellent environmental attributes, this locally made barbecue charcoal is generally acknowledged for its easiest lighting properties - without the use of food-tainting lighting fluid! of carbon sequestration - being not just 'carbon neutral', but 'carbon negative'. 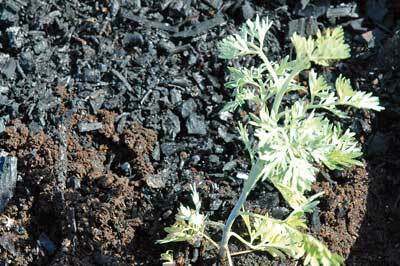 The International Biochar Initiative is involved in many projects around the world to stimulate this development. Is this not better for the world than digging up diamonds? 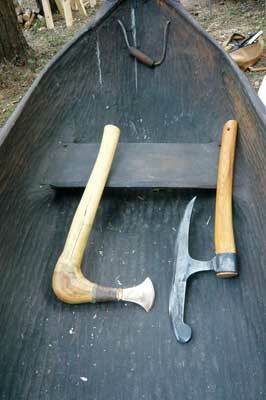 Brian Cawley is a retired coppice worker and charcoal maker. 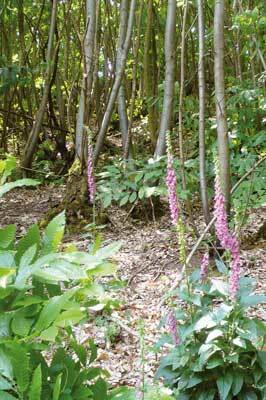 Coming from an engineering background, he and his wife got into the coppice business only in 1995. He is the treasurer of Coppice Association North West and has been a committee member of the Bill Hogarth MBE Memorial Apprenticeship Trust since its start.